Have some poolside time this summer and looking for a riveting read? 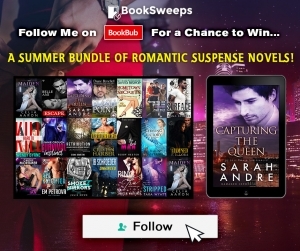 How about winning 21 romantic suspense novels?! I’m partnering with a bunch of fellow authors here, and giving away a digital copy of Capturing the Queen. On July 18th, one participant will be picked to win ALL of these books, why not you? This giveaway asks you to follow as many of us as you want on our BookBub pages, the more you follow the more chances to win. No spam! All that “following” means is in the future you receive a BookBub notice when our newest release comes out. Good luck, hope you win, and thank you for sharing this contest!